Click the photo for a hi-resolution version. 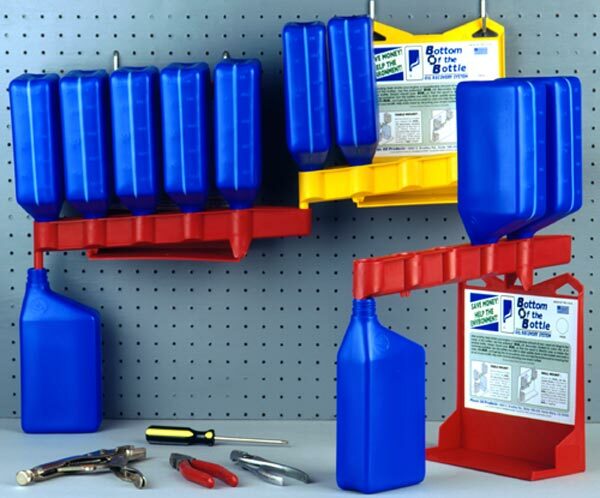 BOB allows you to get ALL the oil out of your plastic oil bottles, giving you full value for your purchase and preventing lots of landfill pollution at the same time. BOB can be mounted on table tops, as shown above left, or hung from any type of wall, as shown above right, such as pegboard, wood, plaster, or metal. The same two plastic pieces make both configurations. of these bottles produced EVERY YEAR. This means that as a country, the United States is throwing away approximately 3 1/2 Exxon Valdez oil spills worth of perfectly good, clean, usable motor oil into the trash every year. Where does YOUR trash go? Ours goes into our local landfill, which means that the oil is going there too, if people don't drain the bottles completely. The main reason so few #2 HDPE plastic oil bottles get recycled is because of that 1-2 ounces of oil still in the bottle when you send it to the recycler. After he grinds up the plastic, he puts it through a water-based detergent solution, which gets fouled up by the petroleum. You need to clean your bottles out before you send them to the recycler or landfill. The best way to do this is with BOB, since you get to keep the clean oil! CLICK HERE TO ORDER YOURS TODAY!!!! to find out how to make your own free adapters. Click here to go to the inventor's home page, to read more about how the tool was invented and to learn more about the man it was named after. Be sure to read the "Bob-isms"! Find out more about the inventor and how he invented and named this important new tool. BOB really is named as a tribute to honor my late father! Read all about it at this site. See what the real Bob looked like. Read all about Pop's personal language, "Bob-isms." 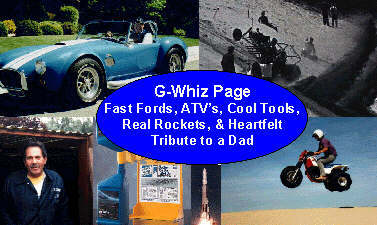 Lots of car stuff: Fast Fords, dune buggies, ATV's, the story of BOB. See photos of Atlas rockets like you'll never see anywhere, because the rocket is on the freeway! See what a real rocket scientist (me) looks like! ...And lots more... Check it out! A new publication from BOB's inventor. Learn how to tune your carburetor the right way, with no guessing! Carb help is free! We've helped to prevent soooo much wasted fuel, we should get an honorary environmental award just for this page! Photos of the real Bob in the service station, with oil bottles draining in the background...Some publicity photos of the inventor. 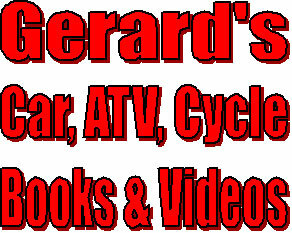 Go here if you are a publication looking for our artwork and press releases. If you want to see some really neat pictures, this has some history, too. This is where I grew up, and learned all about cars, environmentalism, and how to drain oil containers. The Chevron sign could be seen from just about anywhere in Salinas from high vantage points like tall buildings or ferris wheels when the carnival came to town. (Yes, we were proud children, always looking for Pop's sign.) The road was widened a few years after this photo, and Chevron changed their logo, so the sign went away, to be replaced with a small, rotating sign to the right of where this photo stops. The pumps are the old style, with one hose each that would reel out from an internal spool. They dispensed Regular (red), Custom (white), and Supreme (blue) gasolines. The center pump remained for the entire life of this station, even after the two outer ones were changed to the chrome box style. 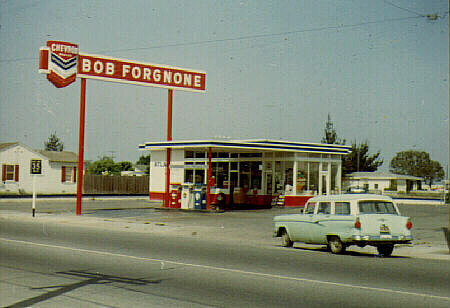 The interesting story behind the sign is that Chevron was building two new stations in Salinas at the same time in April of 1960. My mother was driving by the other station, and saw our name being erected at the wrong location. Mom told the construction crews about their mistake and saved the day! My brother just told me, in February of 2000, that he still has the 35 mph speed limit sign discarded by the city construction crews in the 70's when they widened the road. All photographs and content on this website are copyrighted by the author. Unauthorized reproduction is strictly prohibited!